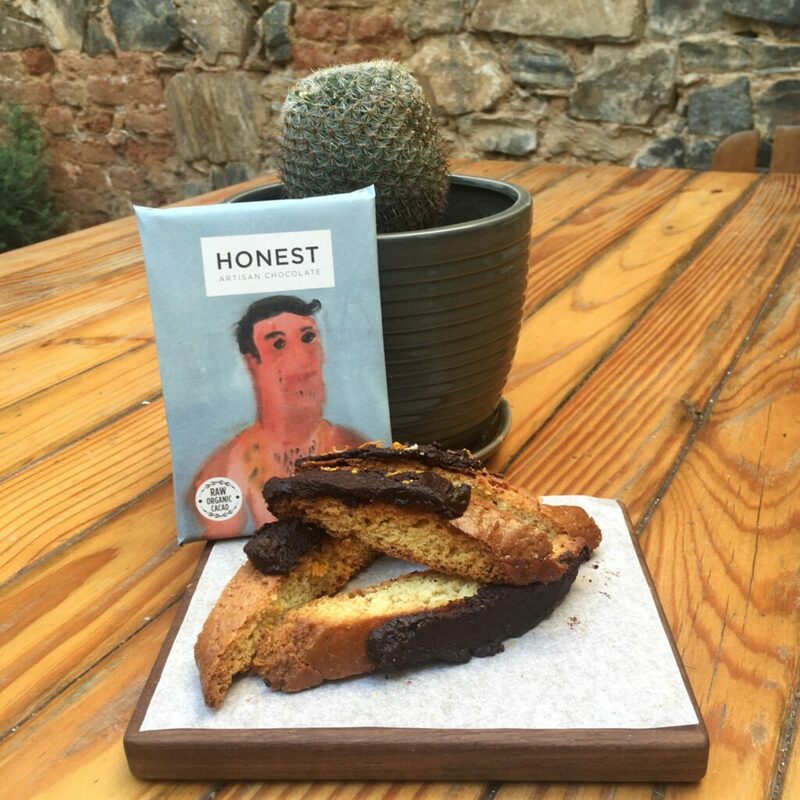 For July, we’ve chosen to hero our 72% Orange slab with these delightful chocolate and orange biscotti’s! Perfect to dunk in a cup of hot cocoa, and they can be kept in an airtight container to enjoy for the whole week! In a small bowl, mix together the flour, baking powder and salt; set aside. In a large mixing bowl, beat together butter, sugar, and orange zest until fluffy. Add in orange juice, eggs, and vanilla and beat until well combined. Add flour mixture to butter mixture in 2 additions, mixing until just combined. Divide the dough in half. On a lightly floured surface, roll each into a 12×5-inch rectangle, and place each rectangle 2 inches apart on a parchment-lined baking sheet. Combine egg white with 1 tsp water and liberally brush over the tops of biscotti. Bake for about 30 minutes until lightly golden and just firm to the touch. Let cool on pan for 10 minutes. Transfer logs to a cutting board. Using a chef’s knife, cut diagonally (at about a 45° angle) into ½-inch slices. Stand each piece upright and place back on the baking sheet. Bake at 300° for another 30-35 minutes until dry and browned. Let cool completely. Melt chocolate in a microwave-safe dish for 2 minutes, stirring after 30 second increments to prevent the chocolate from burning. 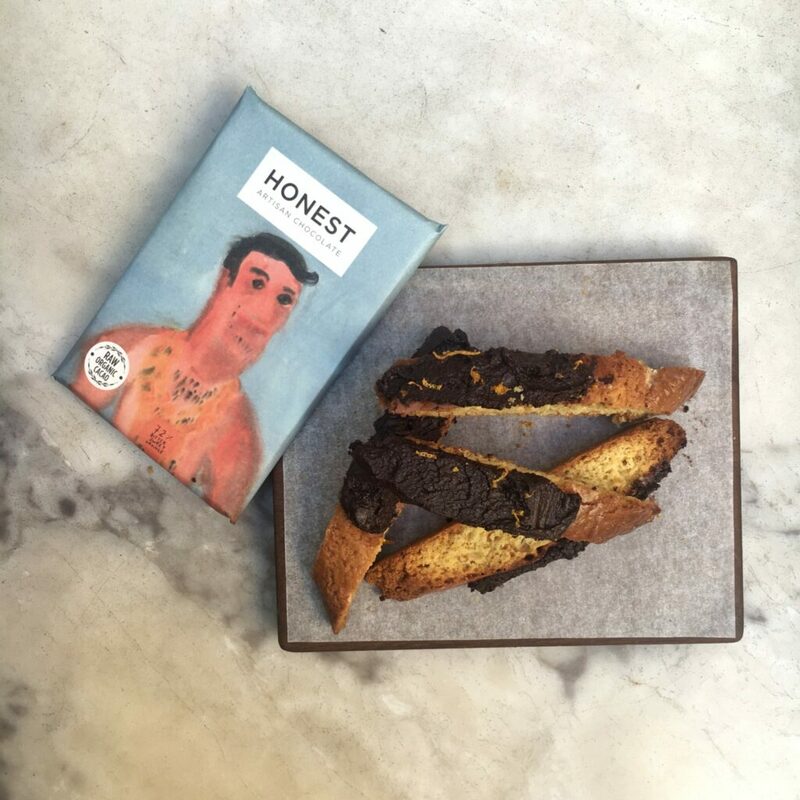 Either dip or spread the chocolate over each biscotti. Place back on the baking sheet and refrigerate until set, about 20 minutes. Store in an airtight container in the fridge, to keep the chocolate firm. Leaving them at room temperature will yield a softer chocolate.